‘A Polythene Free Campaign’ was launched on 8 th February, 2018 at Super Mart 1 and 2, DLF Phase IV,Gurgaon with the collaborative effort of Municipal Corporation of Gurgaon, InterGlobe Foundation and Super Mart Association. Mr. Ranbeer Yadav, President, Super Mart Association is very enthusiastic about this initiative and has issued a circular to all the shop owners for not using polythene. This campaign is being facilitated by Feedback Foundation. 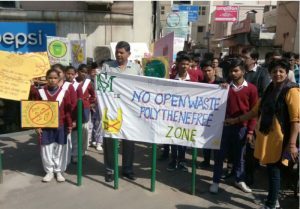 A rally was organized to spread awareness about this campaign. Shop to shop visit was done with team members of the market association to sensitize the shop keepers about negative effects of polythene leading to environmental pollution. The shopkeepers have been enlightened and they have agreed to provide full support. They have been advised to use environment friendly bags such as jute/cloth bags and samples of such bags were shared. Subsequent follow ups are being done to ensure success of the campaign. Under FF’s guidance, segregation of waste at source and in-situ composting is also being done in Super Mart 1.